The rear of the Roselle Park Station of the Lehigh Valley Railroad. The Rahway Valley's interchange tracks terminated directly across from the station, opposite the LV's mainline. 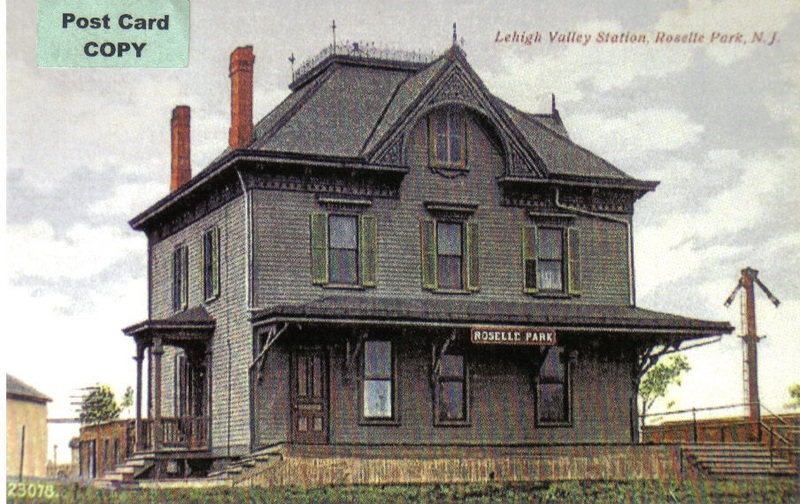 The Lehigh Valley's original Roselle Park Station was located on Chestnut Street in Roselle Park, NJ. This ornate Victoria-style station sat on the south side of the railroad tracks, alongside the street. 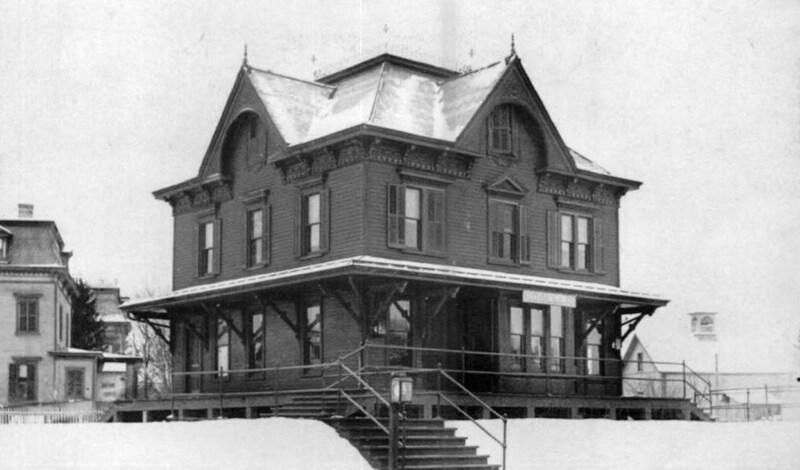 The Roselle Park Station was constructed as part of the LV's extension to Newark and Jersey City, which was opened in 1891. 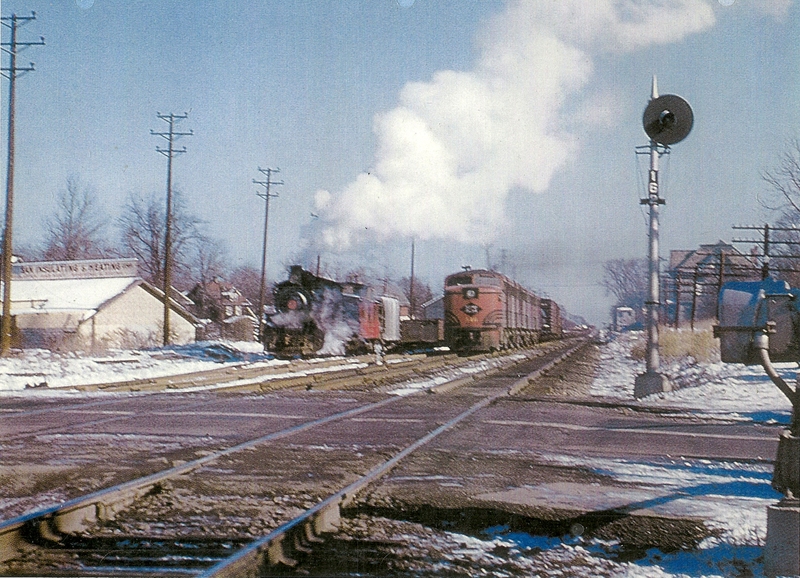 The coming of the Aldene Plan in the mid-1960's and the elevation of the Lehigh Valley through the area warranted the replacement of the original Roselle Park Station. A subsequent, modern, station was constructed on the newly elevated Lehigh Line and the old structure was abandoned and later demolished. This NY&NO ticket (left), for travel between New Orange and New York City, shows connections were made with the Lehigh Valley Railroad at Roselle. Before the Borough of Roselle Park was created in 1901 the LV's station was called Roselle, referencing the nearby Borough of Roselle. The LV station itself never sat in Roselle. Before the creation of Roselle Park in 1901 the station would have been in Union Township. The LV never had a station in the Borough of Roselle. Collection of Thomas T. Taber, III. #15 and Caboose 102 meet a Lehigh Valley Railroad ALCo A-B-B-A set at the interchange in Roselle Park on this cold winter's day. The street in the foreground is Locust Street. The original Roselle Park Station can be seen up ahead on the far right. The sign on the building at the far left reads "Suburban Insulating & Heating Corp." March 1952. Photo taken by Dr. L. Leggett. Collection of Jeff Jargosch.